When I saw the picture of this recipe I knew that I would be making it today. Besides February signaling thoughts of love, it also brings strawberries to mind. Strawberries dipped in chocolate, strawberry pie, strawberry cakes and scones. But this pie sounded so different, yet so simple. Set oven to 425. 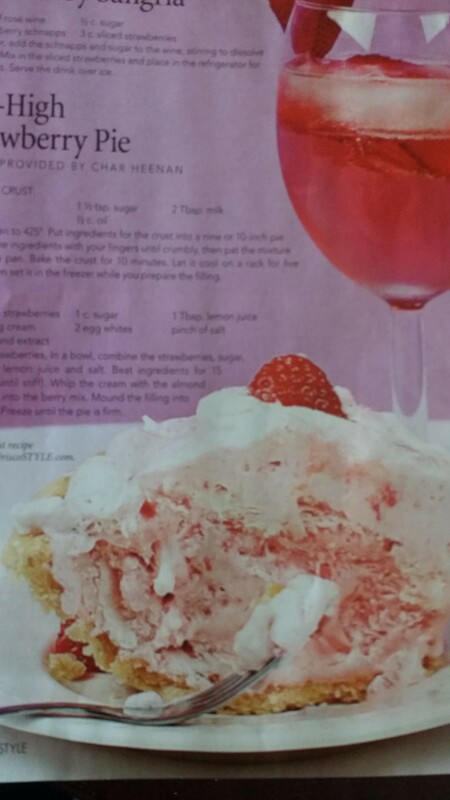 Put ingredients for the crust into a bowl and mix ingredients with your fingers or a pastry blended until crumbly. Pat the mixture firmly into a 9 or 10″ pie plate. Bake the crust for 10 minutes. Let it cool on a rack for 5 min. Then place in freezer while you prepare the filling. Thaw the strawberries. In a bowl, combine the strawberries, sugar, egg whites, lemon juice and salt. Beat ingredients for 15 min or until stiff. Whip the cream with the almond extract. Fold into the berry mixture. Mound the filling into the pie shell. Freeze until pie is firm. Actually we are going to eat Mexican food tomorrow night with friends, so this will be perfect for us to come home to for a cool dessert after all the hot sauce I know we will be having. Sounds delicious will have to give it a go. Hi, Pie & Tart Girl, I just made 2 of the pies so I can have one in the freezer. I licked the bowl clean. Delish. I put one in a shortbread cookie crust and one of them in the crust that it gave the recipe for. Will probably put chocolate curls over the top and some extra whipped cream on top..